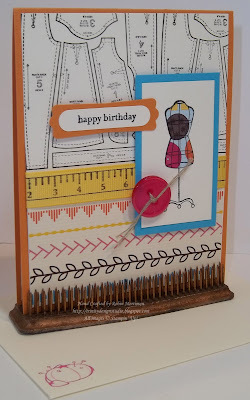 Just a quick post for you today - this is one of the cards that my Stampin' Fools made at our party the end of April. They loved it since they did I decided to go ahead and show it to you now even if the Sew Suite series of products are no longer available. I'm sure many of you still have them laying around so I hope you'll feel free to case this idea and use up your supplies! I loved it so much I even made a version of it for my Mom as her Mother's Day card! I used the Pattern Pieces stamp for the top half. It's stamped in Early Espresso ink on Very Vanilla cardstock. I covered the bottom of the card front with the Sweet Stitches DSP. The card base is Peach Parfait cardstock. The ribbon is the 5/8" Daffodil Delight Grosgrain and I stamped the Tape Measure image from the Sew Suite stamp set using Black Staz-On ink. The mannequin image was stamped twice, once on the Very Vanilla cardstock, once again on more of the DSP, then it was trimmed out for a bit of paper piecing. Such a fun technique! It's layered on Tempting Turquoise cardstock and then I added the Sweet Stitches Melon Mambo Button with some Linen Thread tied through it. 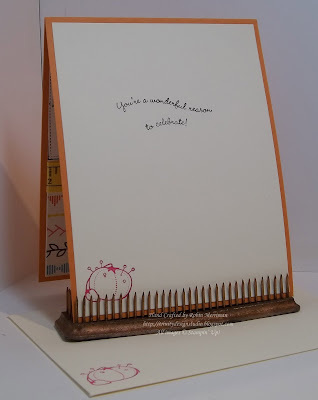 That's all popped up on Stampin' Dimensionals and then the greeting was added using the Teeny Tiny Wishes stamp set. 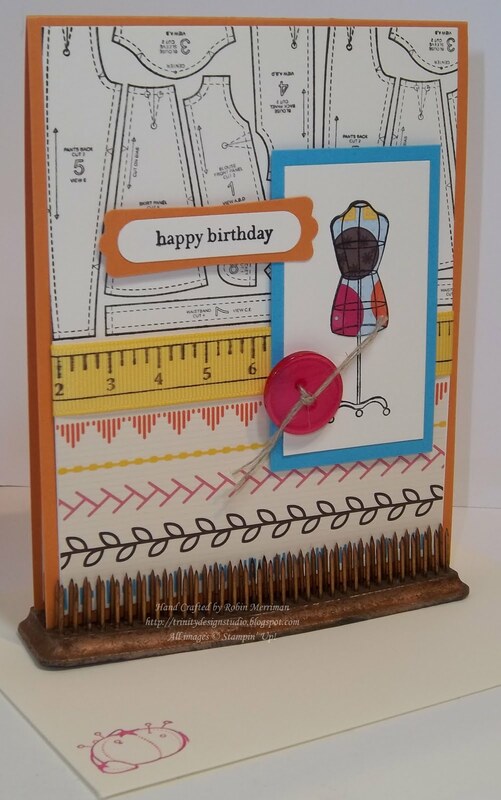 I used the Curvy Verses stamp set and accented it with the little pincushion stamp in Melon Mambo to match the envelope. I've also been getting a lot of questions about the card stand(s) that I use. The one pictured here is one that I purchased at the Hell's Kitchen Flea Market - Antiques Garage in NYC last month. The same place that I purchased my new (vintage) table for my studio! It's an antique flower frog and I believe you can find them at online auction sites as well. I also have a round green one that my BFF Tiffany Bauer gave me in January. I LOVE it too! I've always loved antiques and since Shelli challenged us at Leadership in January to remember to do something to "fill our buckets", I've started visiting antiques stores again from time to time, just because I love it so much. I don't always buy something, but I just love peeking and poking around these beautiful, vintage things that have a history all their own. Oh, if only they could talk to us, what stories they would tell! I wish I knew all the stories that my new table has to share. What joys and challenges were shared around it through the years? Birthdays celebrated, holidays shared, babies fed? Our lives are full of richness and beauty - all in the seemingly mundane daily tread. I hope you take time to savor those moments in between the "major" events of our lives. That is where the real story lies, the real truth of our lives and it's the beauty that you will remember long after the moments are gone. Robin- I know this card -it lives at my house!! I was so touched that you would remember my birthday when you have so much going on- I love the card and you. I'm so glad you are getting to go on the Alaska cruise. God knew at this time last year this is just what you would need this year. have a fabulous time! !